Companies have been using workflow and content management for many, many years. In IT we got used to the term Business Process Management (BPM) whenever we spoke of automated process execution. Not so strange since the term BPM was adopted by all the major software vendors and has received a lot of attention as “the” way to achieve process automation and integration. An interesting (and correct) remark by Gartner that technology is not required for BPM, however the general idea (in IT) has been that BPM equals process automation. The business process is summarized to a complete definition until the level that it can be executed as a program. The efficiency gains of automating the business process much exceed the up-front effort to fully identify it and make it executable. An effort which can initially be very large where the cost is only repaid over many instances of the process. So this approach will only work on highly predictable which is highly repeatable. It’s in some way identical to a factory production line where a huge amount of products justifies the initial up-front factory costs. Using this approach to discover, implement, and execute complex and dynamic processes will be less economically beneficial. We assume that the less complex a process is, the more likely a lower initial investment is required. And the more often the process will be executed, the greater the financial gain and/or business case. When we talk about low complexity high volume processes, we can also identify this as so called “routine work”. Routine work is well known and can be planned to a high level of detail. The process uses a general pattern and is done in a very similar way every time. Because routine work is so predictable and repeatable it has been an ideal candidate for successful BPM implementations. Simply due to the fact that the return of investment for routine work is more likely and easily gained. Back in 1958 James March & Herbert Simon wrote the management science classis Organizations  and concluded that an organization is successful not because it does everything in exactly the same way every time, but because it is flexible enough to adapt and respond to the changes around it. Looking at the present, with changing regulations, new laws, new markets and changing business models this statement seems more true than ever. We therefore can conclude that a rigidly specified organization, that has every process fully planned in detail, will find itself unable to respond to changes. Maybe we might accept that in real life there is never work that is 100% predictable, nor is there work that is 100% unpredictable. So it seems that the approach to automation of more complex and dynamic business processes requires more flexibility. Scientific management as once defined by Frederick Winslow Taylor has been at the heart of business process automation to date. And we have seen how it works for predictable and repeatable processes since they are an ideal candidate for executable BPM. But not all work is predictable and many organizations hold processes which are even unpredictable. When we talk about actions and events in processes being unpredictable, we mean that the sequence of human acts is not known in advance, and the course of the process may vary greatly for every instance. We can easily think of examples like medical care, law enforcement and complex industrial and financial processes. Whenever we read up on the knowledge worker terminology we always come across one individual, namely management guru Peter F. Drucker. Drucker made the first reference to knowledge work in his 1959 book Landmarks of Tomorrow. He loosely defined a knowledge worker as “someone who knows more about his or her job than anyone else in the organization.” What is important is that Drucker already then understood the uniqueness of the job that a knowledge worker performs. Drucker predicted during the 90’s that that the most valuable asset of a 21st-century institution (business or non-business) will be its knowledge workers and their productivity . He even wends further and claimed that the productivity of knowledge and knowledge workers is likely to become the decisive competitive factor in the world economy . So even back then there was already an understanding by business management leaders that the most valuable assets during the industrial revolution were a company’s mass production equipment. Nowadays we can recognize high volume business processes executed in BPM as a form of mass production. Upfront investment which generates value overtime by repetitively producing the same expected result. So if we recognize common grounds between industrial mass production and BPM production work nowadays, what can we say about automation knowledge work in the present or near future? Keeping in mind that Davenport more recently (2005) expresses the importance of knowledge-worker productivity stating that “Within organizations, knowledge workers tend to be closely aligned with the organization’s growth prospects . So with this in mind, how can we efficiently support these knowledge workers ? Today’s jobs are more dynamic, more ad hoc and require more skills and interaction with other specialists. Besides that, the amount of information available and necessary for a single worker has increased dramatically. So knowledge work cannot be matched on a traditional rigid business process (where work is performed according to a detailed plan prepared in advance). Because as knowledge work proceeds, the sequence of activities depends on the situational information. This is the nature of knowledge work. As the available information or external influences change the process has to be dynamic. It is not simply a matter of plan and execute but a continuous dynamic set of activities in an adaptive flow of execution. And while rules like regulations, laws and organization standards will certainly constrain the actions of the knowledge worker no plan is ever final until the end is reached. To digitally support the knowledge workers to dynamically act in their cases, we need some sort of case management solution. A way to dynamically start activities like processes and tasks throughout the case lifecycle. In such a way that the knowledge worker can act on the information available to determine which actions to take. The case management solution should therefore be “information” driven. Forrester’s  defines case management as a highly structured but collaborative, dynamic, and information-intensive process driven by outside events requiring incremental and progressive responses from the business domain handling the case. (Unstructured) data like documents in an enterprise content management (ECM) system and processes in business process management (BPM) suites are clearly key requirements for any case management offering. But only processes and content are insufficient. By adding advanced business rules and clear business analytics in the mix, you get the 4 essential components of a case management solution. Advanced business rules allow for guidance to make sure certain actions are made available or withdrawn during the case lifecycle. And dashboards with case analytics allow for real-time insight on all running cases. These 4 core components combined with good (knowledge) user experience and the ability to integrate with your service oriented landscape are basically the case management product you want. Add some policies management and even some social collaboration and you have a set of existing proven technologies, which together have a very interesting proposition for the modern knowledge worker needs. Our Oracle ACM/BPM system will create tasks which will not only be handled by users in a front-end but also through a B2B connection with our external partners. So we need to publish a message to our B2B partners when a task is available. The challenge here is that the taskId is externally generated in the Human Task component and for the BPM (and BPEL) process the taskId is unknown until the task is closed. So we need to generate our own taskId or a trick to capture and retrieve the taskId outside the process and send it back to the process. We first looked at the option to use the Human Task onAssigned event which we could capture through EDN and handle accordingly. However one of the requirements was that we would not communicate an internal (task) ID to our B2B partners so needed to generate our own ID instead. So we thought about generate our own guid() and place it on one of the ProtectedTextAttributes so we could use this to query the correct task. But Laurens van der Starre pointed us out that Oracle actually has a solution for this and we could use the identification key on the Human Task. So below is an example of a process where our own key (a guid) is generated in the script task and then placed on the human task. When Oracle Business Rules 12.2.1 generates it’s default XSD it uses the full system path instead of a relative path for it’s imports. So make sure to manually change the import configuration. 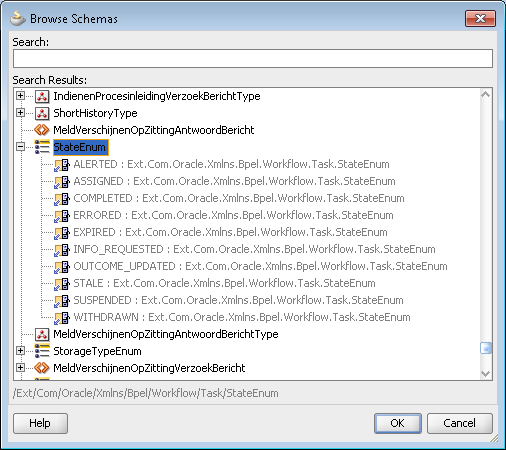 If you want to withdraw a Human Task in Oracle BPM there are multiple options. This blog post will first show 3 options and then explain how to model your Oracle BPM process to anticipate on the result of a withdrawn task. If you use a custom front-end (instead of the default Oracle BPM Workspace) you can use the Oracle SOA Suite TaskQueryService & TaskService to handle your tasks. In the TaskService there are operations named withdraw and withdrawTasks to either withdraw 1 or multiple tasks. 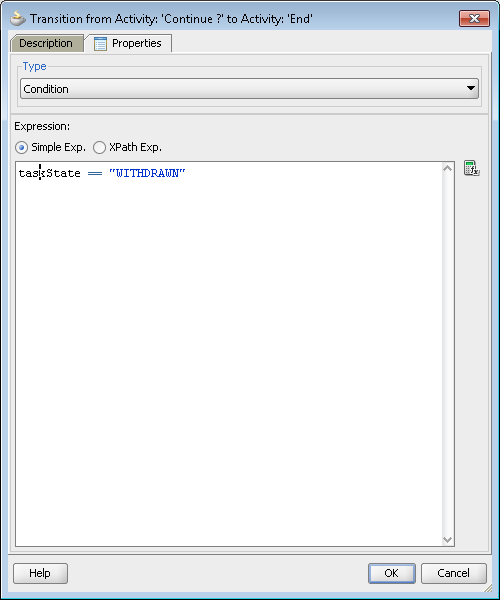 The example below shows a withdrawTask operation request message. This solution is implemented in our Adaptive Case Management project in the case a specific (power)user is logged in and wants to withdraw the current task (and activity) where he/she is working on. When you want to withdraw a task without actually opening a task (or having access to it’s taskId) you can use a signal subprocess to receive an event. The event can trigger an Update Task action which calls the withdraw operation from within the BPM process. 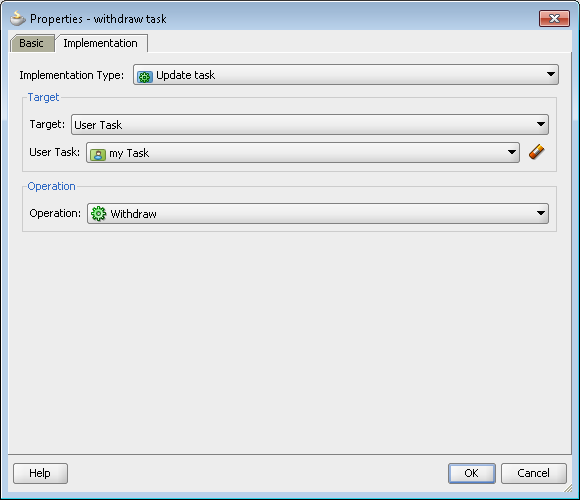 When using the withdrawTask the task state is set to “WITHDRAWN” when the task is closed. So make sure to use the data association on the output tab of the task to store the state in a process data object. 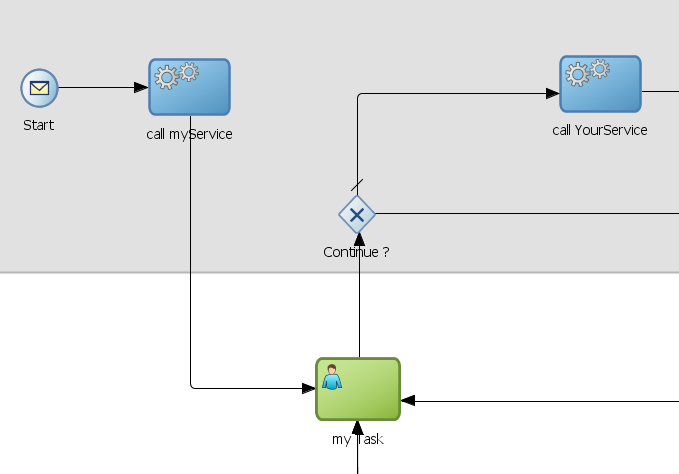 In the BPM process flow we can use an exclusive gateway to model the logic by checking the value of the taskState process data object. Often we use gateways in Oracle BPM processes to check the outcome of a human task and model the outcome to different process flows. However keep in mind that the state can also inform about e.g. EXPIRED, ERROR or WITHDRAWN tasks. NOTE: SOA Bundle Patch 12.1.3.0.2 was released June 2015, click here for an updated blogpost. Just use the search on patch number ‘19707784’ and it will bring you the patch details page with the download (approx. 654MB). The patch contains lots of runtime fixes, but also some JDeveloper 12.1.3 bugs (especially while modelling BPM 12c). So I started patching my own JDeveloper 12.1.3 environment using the OPATCH tool. This folder is called ‘patch_TOP’ in opatch terminology. Since I use Windows as local OS you will need to First open a command prompt with Administrator rights (right-click, run as Administrator).